The mural on Beatty St. is a block long and has been there for two or three years. It's supposed to depict the history of Vancouver, at least I think it is. 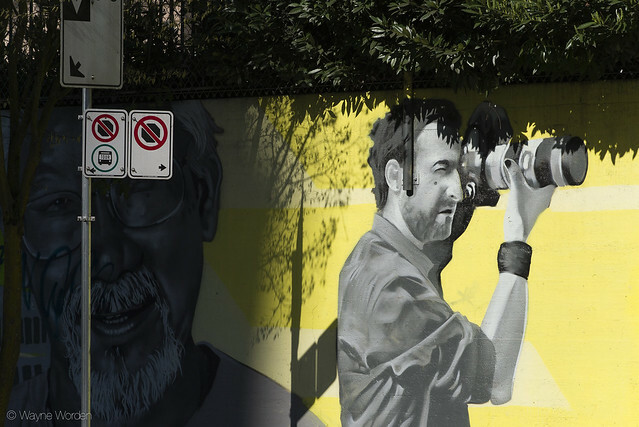 The portraits on the mural seem to be in chronological order, Captain Vancouver, James Douglas, David Suzuki, so on and so forth. I haven't got the foggiest notion who this guy is. I might have guessed Bruce Springsteen but that would just be silly. Must be many street photographers in your city. Or perhaps it is you before you grew your beard? I was thinking you too!!! Maybe the inner you???!!! Genial, j'adore, tu as su ne pas rater cette superbe vue! beaucoup serait passer devant sans voir! I think it is ONE of us,from citydailyphoto.org.